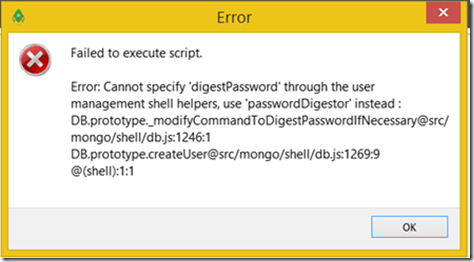 You don’t want your web application to access the database using your database admin user. Additionally you want it to access only one specific database – maybe you have additional databases running in your mongo instance. mongo_orm expects the database configuration as environment variables or as a file config/database.yml in your project. and 27017 is the default port number of mongo – if you set it to something else, change it. and password is “test” in this example. (I assume that your mongo instance binds to localhost, at the default port). This will give you the mongo console. Important! you need to change to the admin database to authenticate! change <adminpw> to the admin password you set. Please ignore WordPress’ stupid habit of changing the quotation marks. These are all supposed to be normal double quotation marks. Important: Do not change the database to the target database to create the new user! Stay on the admin database! Note: both mechanisms are required! If you just specify SCRAM-SHA-256, mongo orm will not be able to log in. this will give the user janet, with the password test the readWrite role on dbname. Robo T3 does not seem to be able to create users properly, use my console method above. (It is, however, capable of creating databases). 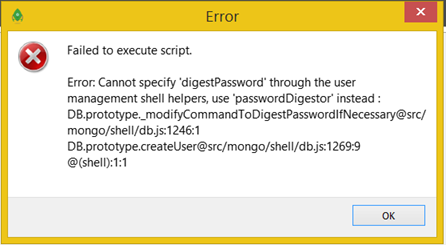 as the Dialogue says, you can’t use digestPassword through Robo T3 or the Mongo Console. Use passwordDigestor: “server” instead. In any case, Robo T3 does not seem to be able to create the users properly – use the console. Then you are not logged in – it will display a long list of information about your server when you are logged in. If you start to authenticate as other users to test the login, this will happen. exit from the console, log in again, and authenticate just once as admin before creating new users.